Have you ever wanted to organize your spices and dried herbs better? The grocery store containers don’t just cut it – they are expensive and not uniform in size, making it difficult to organize. Special spice racks and jars aren’t very flexible and usually don’t provide enough jars or storage. So what’s the solution? This how-to over at Instructables provides it. The author simply re-uses the small glass bottles that many popular drinks come in. Featured is the same bottle that piles up at our house – Starbucks Frappuccino. It is the perfect size for spices – not too small, not too large. You can probably find other drink bottles that work as well. The Instructable goes even further by coming up with an elegant and permanent means of labeling the bottles as well – etching the names into the side of the glass itself. The author uses a lettering stencil and Armour Etch which is a glass etching cream. It looks fast and simple to do. You can go hog wild with this idea. In addition to organizing and beautifying your heretofore haphazard spice rack/cabinet, you could make great Christmas gifts or even sell them on Etsy or at craft shows. Great Way to Organize Bulk Spices by Provide Your Own is licensed under a Creative Commons Attribution-ShareAlike 4.0 International License. 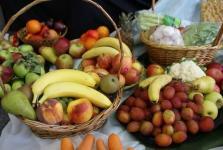 This entry was posted in Food and tagged food storage. Section: Blog. Bookmark the permalink. Both comments and trackbacks are currently closed.